Be the first player to move all your cones around the board and into your home. 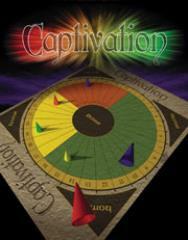 Captivation plays like backgammon, only better. Unlike backgammon, everyone moves in the same direction. Two cones of the same color on one space are safe, however a single cone can be captured. When you land on a space with only one cone of another player on it, you stack your cone on top of it and capture it. Until you move that cone again, his or her cone can't move!